I came across this picture and thought it was a cool idea. Old wooden crates stacked together. This would look nice on an empty wall space. I might have to steal this idea. Also love the color of the wooden crates. Would you use this as furniture in your home? Ooooh , I love grey of any shade and those crates look spectacular. Yes I would use them in an instant and I betcha they would even be cheaper than Ikea billy bookcases too. It's funny but my nephew recently emailed me with a request to keep an eye out for wooden crates, I wonder if he saw this picture too. I'll have to ask him. As they are all the same do you think they are new or old? I would love to know. Very cool idea Claudia...I love it! I really love the color too, kind of a charcoal grey? Thank you for your lovely comment today! 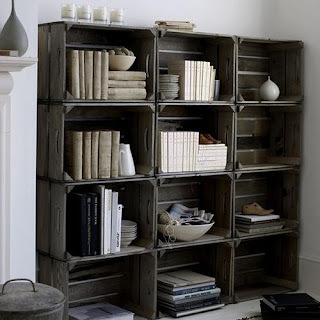 Your blog is fantastic and I love these shelves, what a clever use of crates! Rain drops are falling on my head!